Following my post last week on the Grey Cup Trophy, today I will detail some of the history on the Game. 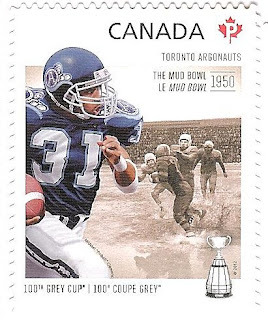 The first Grey Cup Game was played on December 4, 1909 between the University of Toronto Blues and the Parkdale Canoe Club, the Varsity Blues won the game 26 - 6. Since then 99 Games have been held with the 100th being played November 24, 2012. The BC Lions have made 10 appearances in the Grey Cup and have walked away with the trophy on 6 occassions. 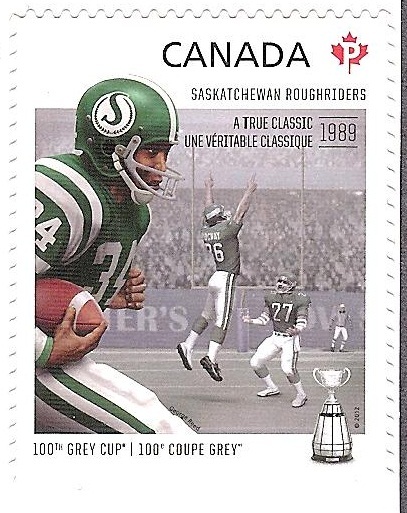 Depicted on the Stamp above is a shot from the 82nd Grey Cup, where BC's Lui Passaglia kicked the winning field goal keeping the Grey Cup in Canada. 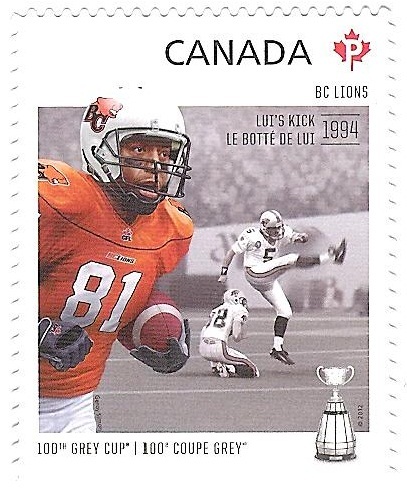 Pictured on the forground of the stamp is Geroy Simon. 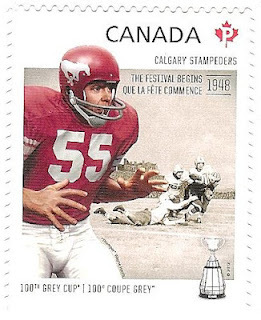 The Calgary Stampeders have played in 12 Grey Cup games and have brought the trophy home on 6 occasions. Represented on the stamp above is a picture from their 1948 Grey Cup win. What was notable about this Grey Cup game, was not only Calgary's perfect season, but their fans that turned the game into a festival. The forground features "Thumper" Wayne Harris. Bringing home the cup on 13 of their 22 appearances, the Edmonton Eskimos have the longest consecutive Grey Cup winning streak of 5 in a row. Between 1978 and 1982, the Eski's under the leadership of Tom Wilkinson and Warren Moon were the CFL's dynasty team. Their 5 in a row record has yet to be broken and it seems that it will stand the test of time. Featured in the foreground of the stamp is Tom Wilkinson. 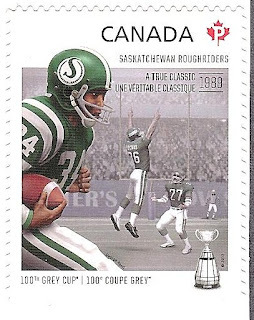 The Roughriders have won 3 of the their 15 Grey Cup appearances. Their 1989 winning performance is refered to as a 'true classic'. With the game tied at 40 points each, Saskatchewan's kicker Dave Ridgway was successful on his 35 yard field goal attempt. Pictured in the foreground is George Reed. Winnipeg has travelled to the Grey Cup game 24 times. 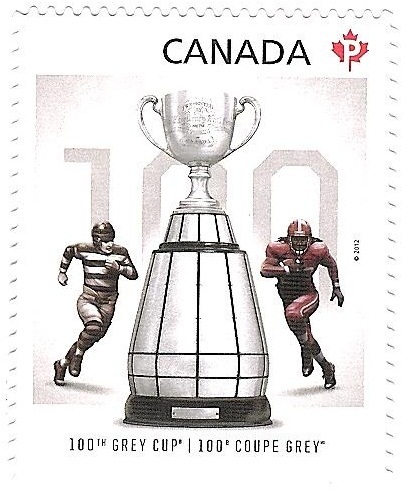 On 10 occasions they have won the Grey Cup. 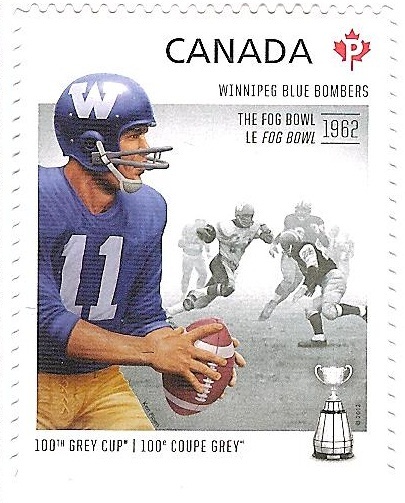 During the 50th Grey Cup game, played at Toronto's Exhibition Stadium, fog began to roll in and with 9 minutes left, the game was suspended due to poor visibility with score 28-27 for Winnipeg over Hamilton. The next afternoon the game resumed and with niether team scoring Winnipeg won the "Fog Bowl". Ken Ploen is featured on the foreground of the stamp. 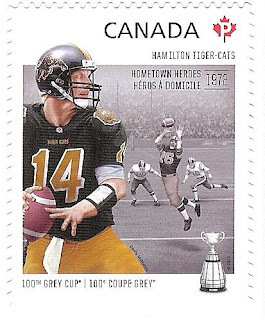 Winning 8 of their Grey Cup appearances, the Tiger-Cats call Hamilton home. 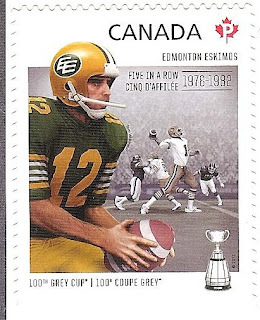 Playing in the 60th Grey Cup game at home, with the game tied 19 year old Ian Sunter Kicked a 34 yard field goal as time expired lifting the Tiger-Cats over Saskatchewan to win the cup. Danny McManus is pictured in the foreground. The Argo's are the Grey Cup's most winning team notching 15 wins out of their 21 appearances. 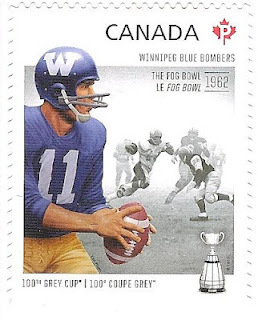 One of their most famous wins is the 1950 win over Blue Bombers. Played at Varsity Stadium in Toronto the game was completely rain soaked and the game was immediately refered to as the "Mud Bowl". Micheal 'Pinball' Clemons is pictured in the foreground. 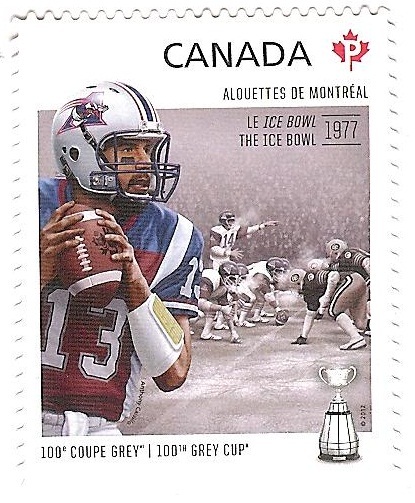 Winning 7 of their 18 Grey Cup appearances on the the Allouettes' most memorable games was the 1977 game played at Montreal's Olympic Stadium. Dubbed the "Ice Bowl" after attempts to melt the snow on the field failed and the resultant water turned to into a sheet of ice. Montreal defensive back, Tony Proudfoot, used staples on the bottom of his and his teammates shoes to gain traction resulting in Montreal's victory. Pictured in the foreground is Anthony Calvillo.